Tendons are bundles of connective tissue fibers that connect either muscles with bones or two separate bellies of one muscle (intermediate tendons, e.g. 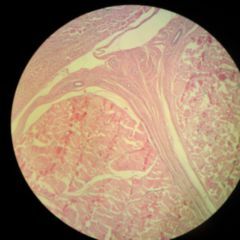 between the two bellies of the omohyoid muscle). Tendons can be located at the origin or the insertion point of a muscle. Every muscle is associated with tendons, even if it seems to insert directly with its fleshy part. 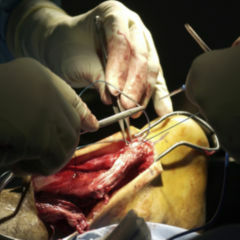 There are also tendons without any contact to bones that connect different parts of a muscle, so-called intermediate tendons. Flat tendon plates are called aponeuroses. An example is the aponeurosis of the abdominal external oblique muscle. Tendon fibers either connect to the periosteum (bone skin) or are directly rooted in the bone. Tendons that run over multiple joints are surrounded by tendon sheaths as a way of reducing friction with surrounding tissues. Tendons can be divided into those that run alongside the muscle's direction of action and tendons that do not. Those that do run alongside the muscle are only exposed to tensile stresses, whereas the others also experience stresses perpendicular to the tendon's direction. 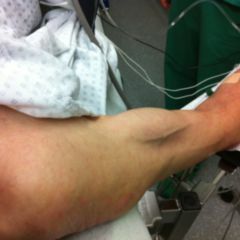 An example for this is the tendon of the biceps brachii's long head which runs across the elbow joint. A tissue layer of fibrous cartilage can be found in the location where the tendon experiences the most intense pressure loads. 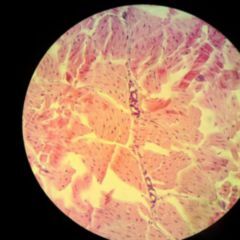 Histological slides show fibrous connective tissue with few cells and occasional elongated fibrocytes which are also called tendon cells. The fibers are made up mostly of collagen, and elastin to a lesser extent. The most important fiber protein is type I collagen which constitutes 98% of the proteins. Other types of collagen (type II, III, IV, V, IX and X) only make up a small proportion. The intercellular substance contains high amounts of proteoglycans like decorin and aggrecan. On the exterior, tendons are covered with a thin "tendinous skin", the peritendineum. Tendons are a bradytrophic kind of tissue which only contains few nerves and blood vessels. This causes tendons to regenerate very slowly. The tendon relays the force exerted by muscle contraction to parts of the skeletal system. This is why tendons are made up of strong collagenous connective tissue fibers that have excellent tear resistance. Besides transmitting forces, tendons also work as springs due to their elasticity. It allows them to temporarily conserve kinetic energy and then release it again, which makes many movements more energetically efficient. An example is the achilles tendon which is passively stretched as a result of dorsiflexion when the foot hits the ground. It releases this energy in the subsequent phase of plantar flexion, alleviating the amount of effort exerted by the calf muscles. Because of high mechanical stress, tendons are prone to degenerative changes that are referred to as "tendinopathies". 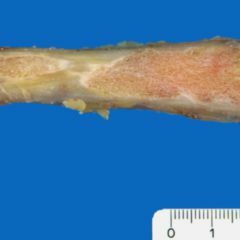 The tearing off of tendons that are firmly attached to bones often leads to so-called avulsion fractures.